Are Motors Worse Than Doping? The first rider has been caught with a motor at a UCI race. Until now thoughts focussed on whether technology and logistics, such as how would a motor work, the possible gains and whether anyone would be reckless enough to try it. Finally someone has been caught and it opens up a range of moral and ethical questions. Is a motor worse than EPO? Over at cyclingtips.com Neal Rogers says the UCI should give out lifetime bans for using motors but this got me thinking, should we give lifetime bans for a motor when dopers “only” get four or less? Everything else being equal this incentives a cheat to take EPO. Rogers makes the point that the UCI’s arms are tied by the WADA Code when it comes to anti-doping but it can decide what to do with motors as it’s specific to cycling and he’s surely right to be want to rid of anyone reckless enough to use a motor in competition. Doping may make you faster but in order to win a race there’s still suffering, sacrifice and training along the way too. To exaggerate to make the point a motor just allows someone to softpedal to victory, conjuring visions of a rotund derny rider slow churning their legs as they overtake a redlining pro. In reality the use of a motor is not quite so advantageous. Anything small enough to fit inside a frame cannot offer huge power to enable an untrained novice to win a World Tour race. As things stand it seems the gains offered by a motor are small and come with drawbacks like the weight of the unit plus battery. Certainly motors can alter a race but the user has to pedal hard. Yet the type or power of the motor will make no difference. We graduate our response doping both on formal and moral levels. Someone caught using heavy methods like EPO or banking blood can expect a four year ban and public opinion brands them as cheats. Someone else who takes a cold remedy that contains a banned substance and puts their hands up for the idiotic failure to check the ingredients will get a shorter ban and maybe some sympathy. With a motor the performance gain might be small but the reaction is likely to be black and white, nobody will care for the battery’s Ah rating nor the max torque of the motor. Again to exaggerate to make the point if someone showed up on Kawasaki motorbike in a bike race nobody would be arguing whether it was a 250cc or a 750cc engine. Instead anyone getting caught is likely to get instant pariah status and possibly even occupy a level in Dante’s inferno that’s below to Riccardo Riccò or Richard Virenque. A motor may bring small gains in reality but it’s pre-meditated cheating of the first order. Another aspect to consider is the shock of finding a motor, it is outrageous and embarrassing. Just when cycling was starting to do a better job with its public image along comes this story that’s part tragedy, part Buster Keaton slapstick. Even the staff in the IAAF must have had a good laugh over the weekend. Part of people’s reaction is disgust and the wish for it all to go away so many want a long or even a lifetime ban as a way of distancing ourselves from this. So far it’s been suggested that using a motor is premeditated cheating on a grand scale and so embarrassing it cuts to the sport’s credibility. Hopefully you agree. Yet as idiotic as using a motor is, doping has to be worse. Anti-doping regulations arguably became institutional follow several deaths, including those of cyclists Knud Enemark Jensen and Tom Simpson. They were drafted and enforced to protect athlete health rather than try to level the playing field. It continues today and EPO isn’t just performance-enhancing, it’s so carcinogenic it comes with “black box” medical warnings like cigarette packets indicating the dangers, abusing steroids and hormones substantially increases the risk of cancer too and that’s before we get to substances like GW501516 a drug that “rapidly causes cancers in a multitude of organs” according to New Scientist. If that’s not bad enough, doping often involves criminal conspiracy, whether crooked prescriptions, stolen medicines or flouting the law in countries where doping is a crime. Fit a motor and the only dangers involve going so fast you crash or injuring yourself with a wrench in the workshop and it’s only illegal during competition. So doping is cheating and dangerous which surely makes it worse. If you’re still not sure, ask yourself whether you could imagine trying a course of HGH for fun in the same way you might try an e-bike. The peril here is relativism. We’re comparing two wrongs rather than rather than good and bad. Both doping and “technological fraud” share plenty of traits: they’re pre-meditated and involve deliberate and blatant cheating so the penalties ought to match. But the process and risks are different. Doping is worse for the athlete because of the damage it can do to health while motors perhaps are more damaging to the image of the sport because they destroy credibility at the flick of a switch. There is one large difference to end this piece on a good note: motors can be detected very easily. Anti-doping tests that involve toxicology are black and white, positive or negative but it’s not always so simple as we worry about riders gaming the bio passport system with tall stories and microdoses and getting away with it. If we want we can use tools as comprehensive as an X-ray scanner or as simple as a hex key or even apps for your smartphone that use the compass feature to detect magnetic fields. You could even use a scale to weigh a bike or frame. In short motors are easily detectable and the simple solution is to look and for the UCI to be seen looking with bikes regularly given the mechanical equivalent of strip-search. Ideally we’d do this like an anti-doping test where the winners and random picks alike are controlled daily. What’s worse, motors or doping? Both. It’s a false choice and chances are that someone reckless enough to use a motor could well to resort to doping too if they’re that desperate. Use of a motor is shocking for its novelty. The UCI doesn’t need to take its cue from WADA when it comes to the length of any ban so it can go for a lifetime exclusion on the first offence. Still incentives matter and comparisons with “only” four years for doping do matter too. Yet instead of comparing the tariffs imposed by officialdom the stronger solution is to work towards a culture than rejects all form of cheating. This can sound like politician speak and when it comes to controlling blood doping we’re still searching for the right tools. With motors we can start with hex keys. My reading of the narrative is that the statements riders have made about PEDs vs Motors reveals a disappointingly still persistent view in the pro peloton that doping isn’t so bad reallybecause people have always done it, its sort of like an elaborate form of nutritional supplement and besides you still have to suffer in training. As far as I’m concerned cycling is a union of human and machine and chemical tampering with the biomechanics of the human element is exactly as bad as artificial mechanical enhancement of the bike. The health risks and criminality aspect just makes it even worse. However I believe in second chances, punishments for first offences should be harsh but not for life. Very good points about the peloton and drug use, including legal: it’s going to take a long time and a lot of effort to change the attitude – especially as ex-riders often stay in the sport. Doping in cycling has been either legal or completely unenforced for much longer than it has been illegal. Doping is a legitimate part of the fabric and culture of the sport. Now, the rules have been changed and we are in a time when the members of the generation from the de rigueur doping culture are starting to die off and the athletes that they directly influenced are retired, but it would take a few more generations to erase the mind set completely. There’s a certain air of Wacky Races comedy which makes motor-cheating somehow far less sinister (to me) than either the Mister-Hyde creepiness of doping, or the vampiric practice of clandestine blood doping. However, as a betting man I find race throwing and fixing more outraging and less forgivable than the two forms of dishonesty being compared here. Interesting point about the comparison between cheating to win and cheating to lose (race fixing). Some years ago I read a great article (sorry don’t know who or where) about the reasons in most sports match-fixing is seen as far worse than doping/cheating, because at least dopers are still trying their best to win, while throwing a game/race makes the whole thing a farce, no better than WWF or whatever. well that depends on the context – the social aspect of the peleton has always fascinated me – do someone a favour here, it gets returned later in the season etc etc (Contador gifting wins to allies…). I love that as it’s another layer of complexity to be understood and argued over. Betting is just a derivative ‘sport’ , so tough luck if cycling doesn’t fit your needs in these cases. Go and bet on a tennis match instead…oh…soccer then…oh… athletics?… hang on…. You don’t have to be a ‘betting man’ to hate the fixing of races, it takes away all the point of sport. But as we’ve both said, cycling is a lot more complicated than that (in a wonderful way). I can’t quite put my finger on why it is, but those little alliances / disputes in the peloton, across team borders, add to the interest and intrigue. Whereas if one county cricket team deliberately lost a match so that their mates in a another team could win the championship, that would feel so so wrong. Alliances across teams, working together to maintain GC positions then gifting a stage win etc. isn’t what I’m talking about – I think that’s an acceptable and fascinating aspect of the sport. I’m talking about throwing a race for money, whether fixing for shady bettors or buying a win. I have the impression it is less prevalent in cycling than other sports (cricket being the obvious example, though I suspect it is also far more widespread in football than anyone would like to think), but there is at least one well-known fairly recent example as pointed out above. Might a couple of magic spanners, a few well-timed sticky bottles and a moment of team car wind-shelter give the same energy discount as a small motor and battery? How well timed? Up the Koppenberg to drop Fabian? If not, then no. Precisely. As always, it’d be nice to have a black-and-white distinction, but a lot of it comes down to context and rightly so. Your legs don’t store a precise number of kJ of energy and dole them out at whatever rate you demand, getting a 20W boost when the peloton is soft pedaling along is very different to a 20W boost up a decisive climb or to bridge a gap. Case in point: Cancellara’s sticky bottle DQ from the Vuelta last year. Unless I missed something, I think you mean Nibali’s DQ for the stickiest of sticky bottles at the Vuelta. I imagine Spartacus in his pomp could’ve towed the car at 40mph, rather than vice versa. Isn’t one of the many depressing aspects of this saga that “Spartacus in his pomp” is now something that many more people are questioning? Spartacus towing the team car is a comical way to portray exactly what I’m afraid may have happened. His comments on MotoGirl have been very unconvincing. PT, do you really think Cancellara rode a bike with extra levers on it and no-one in the media noticed? And no-one in the peloton noticed or said anything? 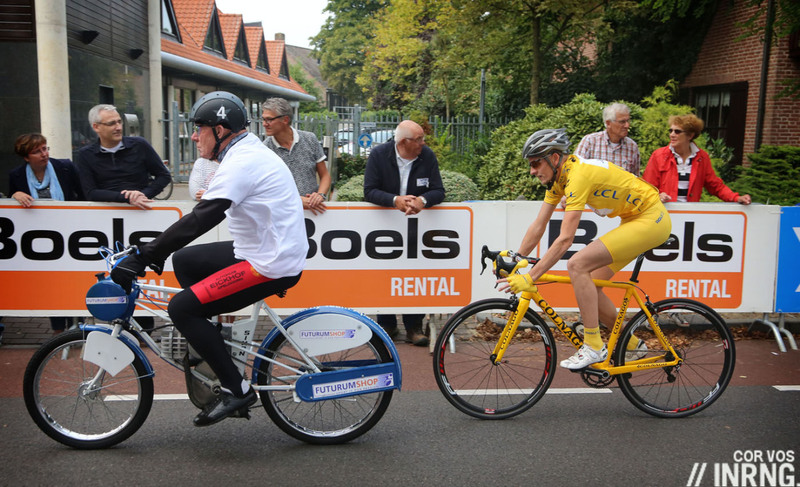 And, even more incredulously, he rode it through Belgium – beating Tom Boonen – and not a single Flandrian bike fanatic noticed? I’m equally skeptical of the rumours about Fabian’s use of a motor. The video is really inconclusive and makes it look like he’s changing gears, not turning on a motor. Besides, if Fabian’s really done this over the years, then how many mechanics would have to be discrete? It would be a huge team conspiracy. I don’t really believe anything on this topic and thats the problem. Claiming something didn’t happen just because no-one noticed or said anything is no defence either. I’m not a conspiracy theorist, just mildly sceptical. PT, by your logic, then, Boonen could have had a motor in his bike: ‘Claiming something didn’t happen just because no-one noticed or said anything is no defence’. Believing this sort of thing is the opposite of being sceptical. And perhaps if you’d won the Ronde and people kept suggesting garbage about that for years, you might be fed up too. No reason for him to answer questions about this any more than there is any other rider. Oh, and sorry but it’s “that’s”, not “thats”. Just my OCD side coming out. That’s right, no it’s not, that’s a matter of opinion and touché. PT: So, then you have to believe that all riders – or certainly anyone who rides strongly – have a motor? My point is that there is no reason to single out Cancellara. Much as I enjoy watching bike races, I don’t take the results too seriously. Especially when someone beats a quality field by miles or dominates a whole season. Motors, drugs….whatever…decades upon decades of cheating can’t be ignored. Drugs, yes. Motors, I have my doubts just because it’s so much easier to catch them doing this. Also, you need any mechanics, etc. involved to keep the secret – people are not good at that and if, say, Big RiderX had cheated, the mechanic involved could make a lot of money out of selling his story to the media – or Big RiderX would be endlessly open to demands for further payment. Exactly, the amount of staff that are involved make sport-wide use of motors very unlikely. Plus, mechanics often do their work in the open at the races, where anyone can see them. If there were motors, the risk of a passerby seeing this would be high. My initial response is that you could legalize and regulate doping and it would still be cycling. To do the same with motors would be creating a different sport. But it is interesting to have perspectives that blur the boundaries and then to reconsider where the lines are. For example, what if you were allowed an electric-motor on the bike as long as you started with a flat battery – the battery could only be charged through your human effort during the race. I suspect this would be impossible to police, but would we still think of it as cycling? At least ride a bicycle in bicycle riding. The first and most important issue here is that the UCI have been undertaking tests for motors, and in this instance may even have had prior suspicion. For once kudos to the UCI. The penalty for the use of a motor needs to be both meaningful and tough. This is not only cheating of the first order, but it brings still further the name of the sport into disrepute. Sure, doping can be worse than motors. If an undetectable variant of GW501516 had stupendous performance enhancing benefits while carrying the same risks, and riders started using it en masse, the outcome would be catastrophic. It could put thousands of youths in a “be a champion and very likely die of cancer” vs. “not being able to do what you love” quandary. The utilitarian repercussions of which are likely much, much worse than people getting away with e-bikes. So the moral hazard of not adequately punishing doping is much higher. However, doping is generally far harder to prove. And doping intent is even harder to ascertain. There is a chance that even a reputable protein powder could be contaminated with detectable amounts of steroids. Even though most of the “tainted meat” excuses have been found by courts as very likely to be cow dung, the reality is that there remains at least the shadow of a doubt (beyond the shadow of a doubt is considered an imposible standard in legal matters), if not (usually) more, that the defendant may be partial or even fully innocent. Reasonable doubt must imper over unreasonable standards, but the potential for unjust punishments (particularly relative to unpunished dopers) is still significant. On the other hand. at this point in the evolution of technology, it’s harder to get away with motor doping. And if your mechanics failed to notice a motor in your bike you are at the very least guilty of hiring staggeringly incompetent mechanics. In any case someone has acted out of such clear malice or extreme ineptitude that punishment should be meted. The minuscule chance that a wrench could be so incensed at a rider that they’d take a lifetime ban themselves in order to screw them over seems a this point remote enough to overlook (no to mention that the guilty party would be banned out of the sport as well). C’est la vie. In the words of William Gaddis: “Justice? You get justice in the next world. In this one you have the law.” Doping may be many times many-times-worse, but proving guilt is a much tougher, more expensive, and more fraught proposition. Technological fraud, while often a far lesser offense, can and should be stamped out of the sport. I agree with most of what you said, but, as the current situation shows, motor doping is not so simple to ‘prove’ either. The rider was not caught riding the bike, and there is nothing to show that a mechanic (who may just be a guy paid to was bikes) did anything other than wash a bike and put it with others, so essentially we have the mechanical equivalent of ‘contamination’ as an excuse – an unclean bike ended up mixed in with the clean ones. Without all the facts and the outcome of an investigation, we find ourselves in virtually the same situation as with non-motorise doping: an unlikely, but not impossible ‘tainted bike’ excuse that may provide enough doubt that ending a young girl’s career is seen as too harsh given the evidence…and rightly so (??) – as generally punishing someone who is innocent is seen as far worse than letting a guilty person get away with their offence (which is something equally likely to be abused by those that are guilty). Had she been caught riding the bike, then that’s a different story. I didn’t want to go into the particulars, but precluding the investigation I think Femke’s excuse sounds ludicrous. But sure, if the investigation turned up that the circumstances are just so (and I seriously doubt they will turn up that way, as far too many things would have have to have gone exactly wrong), then, for a first case, given an under 23 set-up, van den Driessche can be cut some slack. Still, her mechanic shouldn’t be allowed to work again in a UCI race. You really can’t miss a two kg heavier bike with extra buttons and wires coming out of the bottle cage and the seat tube (if that was the case). But sure, for lower categories you show some leniency (as in, less than lifetime ban), if they can really line up all their ducks in a row. However, for an elite cyclocross racer or a WorldTour pro an excuse like this would be preposterous, particularly from now on given that the existing strict liability has been clearly highlighted to everyone. In any case, most pro bikes are meticulously inspected by mechanics before the race numbers are placed. So as I stated, at the very least the team and rider would be guilty of working with completely inept mechanics. I think the fact that other riders are skeptical to the point of being aghast and calling for lifetime bans points to the scant believability of Femke’s story, even given the less-than-WorldTour conditions. Every compliance standard is subject to probability. Every once in a while chemical contamination can happen, blood vales may spike, wherabouts may be improperly inputted. But I have never heard the story of a pro rider was inadvertently outfitted with a wrong bike. It surely happens, but it does so very, very rarely. The odds that that not it only that happened in this instance, but that stowaway bike was outfitted with an as yet exquisitely scarce hidden motor are truly nominal. Blackstone formulation goes “it is better that ten guilty persons escape than that one innocent suffer”, not “it is better that one thousand persons escape than that one innocent suffer”. Again, no system of law (or regulatory framework) survives a beyond the shadow of a doubt stipulation. One can argue that the technological advantage of a hidden motor is in line with the advantage of other modern day cycling-related technical advances. After all, why would electronic-shifters, bike computers, ceramic bearings, aero rims, carbon frames, Adam Hansen’s shoes, and so on and so forth, be accepted by so many and used so widely if they were not better than what existed before? Their use must surely give some advantage–no matter how incrementally small it might be. If that premise is true, then the only difference between the accepted use of these techs vs. hidden bike motors is that the former is recognized by all and deemed to be “legal,” while the latter is clandestine and “illegal.” Conclusion: Even the purists will agree–not all technological advantages are shunned by cyclists. The use of hidden motors might feel more offensive to our moral sense of fairness and justice, yet, new advances in electrical, and now, wireless, shifting and other hi-tech gear are so commonplace in cycling that these are not even worth a turning of our heads anymore. As Inrng pointed out, perhaps it was the novelty of actually finding the hidden motor that startled us. Who knows, . . . if the bicycle makers discover that they can make money from such things, maybe we’ll see soon in the pro peloton a road bike with a lightweight ceramic motor mounted in a beefy carbon frame with disc brake compatible hubs. Perhaps the motor won’t even need to be used to propel the bike forward, but be used simply to generate enough electricity to power up all the electrical gadgetry found on today’s road machine! What a monstrosity that would be! But I’d buy one. This misses the point. The technological advantages that are acceptable have a key difference to this one unacceptable advantage: they don’t remove or lessen the burden of actually moving the bike forward. Actually they do lessen the burden. I’d say the point is what we allow in competition under the rules and what is banned. We allow ceramic bearings, spokes and bar tape but outlaw motors and fairings. These are the agreed rules which we can debate but flout them and you risk a sanction, a motor is flouting them so wildly the penalty will be huge. I appreciate this perspective as a matter of debate though respectfully take great exception to comparing increasing aerodynamics and decreasing rolling resistance allowing the human to power the bike forward easier to applying a motor to propel the bike forward sans human. I would hold parakeet theft to worse than either. I just got this, hilarious! What a lovable bunch, that family. When I read your comment earlier, I thought I’d missed some obscure rhyming slang but having just caught the news about the father and brother it now seems almost unreal, adding to the slapstick, wacky races tone of the whole story. I think motors are worse than doping. I have no nostalgic love for dopers – I’d love to get rid of them all. The difference to me is that – while we know that doping has sometimes been condoned or even organized by the team, coaches, directeur sportifs, soigneurs – there is at least the possibility that the athlete has gone outside the team of their own accord. So while I think motors aren’t any worse as far as the athlete goes – cheating is cheating – I don’t believe that a team could credibly deny that they had no idea. Could a mechanic assembling the bike or cleaning, lubing the bike after every stage (or possible every lap in a cross race) truly say they had no idea? I think motors are worse because I believe they imply organized intention to cheat. My $0.02. Moto-girl has really stirred the pot! Imagine this: for many, many years cycling had been dealing with cheating through mechanical methods. Then, rumours had begun about some riders not bothering to cheat using motors etc. But instead by injecting a chemical(!) into their body. Framed this way, cheating with drugs seems to me more ominous and sinister than motorized cheating. The ‘newness’ of this latest way to illegally gain advantage is what we are trying to wrap our heads around. Exactly. Motorised doping should be pretty easy to nip in the bud. Take your eye of the chemical or blood doping ‘ball’ for a one moment and its malign influence will grow, once again. For me, cheating with a motor is worse. Much worse. It’s one thing that if shown to be wide spread could cause me to turn my back on the sport for good after a life spent racing bmx, road, cross and mtb. I will always ride but following e bike racing? No way! The dopers know what they are getting into and my sympathy is about the same as it is for a smoker. The creepiest thing about Armstrong was that he got cancer from doping, beat it against all odds and then through away that second chance and doped even more. Also, surveys of prisoners have shown that they are likely to significantly differentiate between a crime they have committed and a relatively similar crime and will suggest significantly harsher punishment for the similar crime. It has been posited that is a response to suppressed guilt and that declaring an alternate act as significantly worse makes the declaree feel, by comparison, less guilty about their own actions. The disincentive to use a motor needs to be strong enough that others don’t try…. Neal Rogers is trying to make that point. Unfortunately, people can make bad decisions when ‘folks’ around them encourage them to do things. If you are under 18,….. maybe the rules are different. Now to a minor social problem of lesser proportion…. in mountain biking vacation areas, tourists really struggle to make it up the hills at altitude, so as of recently, the enterprising bike shops rent e- mtn bikes. Well, there are also many less-gifted bikers that struggle up hills as well, what’s the best way to make it up the slope with a spouse or friend? (1) Riding a lift (2) an ebike for the 95% of trials that are not lift served. I have read the bikes handle well going downhill…..
For those in to Strava – some times may be enhanced differently than Digital EPO. I often wonder of we have missed out on the ‘human laboratory’ aspect when considering drugs in sport. That is a huge loss of data to us as a species. Just another way of thinking about it is all. Personally I am 100% anti cheating simply because it makes such fools of us fans. You’re totally right, however some work goes on before the drugs arrive to the sport, or just when they’re entering it; to name the last couple of cases which come to my mind, both CERA and ketones were tested through scientific studies with pro athletes some time before being forbidden (or detectable) – the latter still aren’t. Thank you for the voice of reason. What struck me most about this case is that a huge majority of commentators see the “regular” doping as not that bad, as “you still have to push your self” and “a doper still can have a bad day”. Surely the key difference is a motor is driving the pedals, a motor, it’s a motorbike people. Lifetime ban for a first offence? My first thought when I read Neal Rogers’ opinion piece calling for lifetime ban at Cyclingtips was “How very American”. Four years for the first offence should be adequate for motorcycling too. Well done. Thanks for taking some of the hysteria out of this issue. One thing comes to mind – when (battery powered) electronic shifting systems were first allowed to be used in this sport, I wrote an essay in opposition to their use. In my view ANY battery that replaces ANY effort made by the rider, despite the minimal efforts required with modern mechanical shifting systems, should be banned. I went on to point out this is a kind of “slippery slope” issue and wondered how long before battery power might be used to do more than move the chain onto the selected sprocket and end up powering the bike in some way? Now we know. If I was the king of cycling, I would ban ANY battery-powered or electronic equipment from use, including power meters, radio earpieces and even simple cyclometers. ALL of the energy used to race a bicycle (including brain power) should come from one source, the rider. If the technology doesn’t add to the enjoyment or fairness of the sport, why have it? And if it takes away – or can take away – from the enjoyment or fairness, get rid of it. Quite right, ban the stupid clip-in shoes as well. If you can’t keep your feet on the pedals you shouldn’t be a professional cyclist. What I said was: ‘if it takes away – or can take away – from the enjoyment or fairness, get rid of it’. Some technologies are good for cycling; some are not. And if there was no electronic equipment on a bike, wouldn’t that make it easier to spot an electric motor? OK, I admit I was being facetious. But being serious – you do have to draw the line somewhere, but it will always be arbitrary, there is no ‘best way’. You would prefer to not have anything electronic on a bike, but some people do. I can’t remember your opinions on the subject but some people would prefer TTs to be on standard bikes, some people enjoy seeing different bikes on show. I guess that’s the point, people have different opinions and someone (in this case the UCI) has to decide what is legal and what isn’t. If you do something illegal you’re cheating and should be punished. If you disagree with what is legal you should petition the UCI and/or have (hopefully genial, again sorry about my previous comment) chats on cycling blogs. Malcolm, you’re right, there is no best way and I only write what I think – and I know it’s nothing more than that. Sorry if I was a bit grumpy about your comment: I just get a lot of people claiming that I want to return cycling to some non-existent past utopia. ‘If the technology doesn’t add to the enjoyment or fairness of the sport, why have it?’ – I was talking about the sorts of technologies that Larry had mentioned in his post; as this was a reply to Larry’s post. You are Humpty Dumpty, aren’t you? ‘Technology’ in that comment means just what you want it to mean, neither more nor less. And what you want it to mean is what you don’t like, happily and conveniently excluding what you do like. Yes, when I write a sentence the words mean what I want them to mean; same as everyone else – and I clarified what I meant. As for people who remain anonymous or use different soubriquets to criticise other posters – not what they post – it’s still obvious that it’s the same people doing this over and over again. Also, “all of the energy”? Even during the down-hill sections? As you have said recently Larry, pro cycling has *always* been about the cheating. It has got nothing to do with “man over machine” or post 1980’s technology. Sport mirrors life, as the saying goes, and nowhere is this more blatantly so than cycling. Is your answer to Inner Ring’s question therefore a resounding’Yes’? The good old days of steel bikes and Italian groupsets….and the Victorian heroine and cocaine speedballs, the cocaine and cocoa butter leg-rubs, the Belgian ether-soaked sugar cubes, the strychnine and the trimethyl, and the amphetamine La Bomba? The electronic button is just another facet of this game. But surely it’s a less serious, and harmful, transgression than drugs? Not allowing every piece of technology doesn’t mean going back in time. So your position is “They’ve always cheated, they’ll always cheat, so we should just let ’em cheat”? While we can’t redo the past, what happens in the future can (somewhat) be controlled when it comes to enforcing the rules. Or should we just ditch the rules? What kind of “sport” would it be then? No, that isn’t my position at all. Just that cheating is not the sole result of technological advances and, of the two (chemical or mechanical doping), I find the motors aspect less harmful. Greg Le Mond has provided a good interview in Cycling Tips today and has suggested that an X Ray Scanner be used to test the bikes. Fight technology with technology. I don’t think you can just call an arbitrary halt to bicycle evolution. Ecky – you’re forgetting the main point of this. In the court of public opinion, motorised doping turns cycling into a joke, which will hurt it worse than PEDs (which people understand are used in all sports, and therefore are somewhat “accepted”). Motors in bikes will make our sport a joke in the public’s eye, and will turn people off more than anything. If it turns out that Fabian and other did put motors in their bikes… what if Lemond is right for the second time? Don’t forget, everyone doubted him for a long long long time last time! Provided that the sport had robust controls in place to counter use of motors, I don’t think it would ridicule cycling. It would for any cyclist concerned however, and probably effectively finish their career. If Lemond was right and motors have been used for a while, the controls need to be put in place quickly. And teams / owners need to clearly state their position that any of their employees involved would be summarily dismissed and could be sued for breach of contract / damages. But I still retain the position that doping is ‘worse’ than motors and that human health is the ultimate concern. If human health were the ultimate concern a sport where 200 men fly down a mountain side at 100km/hour wearing nothing but spandex would be banned! This objection is nonsense, as it has been shown before in this blog. To put it down simply, it would be quite complicated to eliminate descents, or many descent-related risks, without substanstially altering the nature of the sport. Same can’t be said for doping (well, the funny answer could be that also doping pertains to the essential nature of cycling… but I think you’ll easily get what I mean). Besides, doping-related health risks are probably way higher than those which depend on descent. The fact that the latter are more visually impressive doesn’t change the broader and deeper impact of the former: sadly, this different perception is precisely what makes doping so easy to foster… and also what, many times, should prevent us from considering a doped cyclist as a fully responsible subject taking well-pondered decisions. Absolutely, I couldn’t agree more in principle. Racing a bike should only be about the purity of the ride and the ability of the racer to suffer. This sport needs to spend more time focusing on the tradition romanticism of racing through the French, Belgian and Dutch countryside, past the old battlefields where many of our ancestors fought the Great Wars than a stupid power metre. Electronic technology does not have a place in this picture. I understand that our world is different, and that, for example, a sponsor’s wishes should be granted (ie. Garmin wanting it’s units on the bikes), but this sport needs to always try to return to basics as much as possible. Whenever an issue like this comes up, remove all items that can make it harder to enforce, eg. ban electronic shifting for a year so no team tries to use the shifter’s battery to power a motor. This issue has to be dealt with swiftly! +1 Bicycle racing itself is an anachronism, no? What is a contest supposed to determine? If you’re interested in the fastest way round France on two wheels, fully-faired motorcycles are probably the most technologically advanced way. Where do you put the rules between 1900’s bicycles and 2016’s? I think stopping development at electronics (batteries of any kind) is a good place to stop. No batteries = no motors, no earpieces (riders have to think for themselves or at least get yelled at out of the car window by the DS for everyone to hear) no power-meters (Geez, I wonder how much longer my competitors can keep this pace up and how much longer can I?) not even a cyclocomputer. If “anything goes as long as you pedal it” is the limit, do you want to watch fully-faired recumbent bicycle racing? Perhaps Velon should develop a World Tour for those? We don’t *need* electronic gears – what we do need is an easy way of detecting if someone has anything electric on or in their bike. Ergo, ban all electronic stuff. I kind of agree with this – I’ve been wondering when someone will design a mini kers device for bikes – ie storing kinetic energy from a downhill section to feed it back on an uphill. A blanket ban on any electronics/wiring etc of any sort in racing wouldn’t be a bad thing in my mind and certainly wouldn’t take anything away from the racing (arguably it would add quite a lot). Ha ha, I am looking forward to the first case of a pro bike bursting into flames following a crash. Batteries have a lot of stored energy. That would make for a classical The Simpsons/Family Guy scene! You took the words right out of my mouth! I can just see the bike catching fire and sizzling ‘a la hover boards, just as the “winner” of Paris Roubaix enters the velodrome. Some people simply are unable or unwilling to see more than themselves and how things make them feel. How anybody can think a competition in a sport or entertainment is more important or serious than a life or the health of someone is beyond me. For 17 years now I absolutely love cycling – but it is just a sport. I would give it away without thinking twice, if it would bring back just one of those lifes lost. So I am glad when people only use motors or cars or trains. And no matter how you put it, apparently it is too hard to unterstand for some, that a motor does not mean you don’t have to ride and train hard anymore. Drugs and a motor are both ways to enhance your own abilities. No need to get all worked up about one kind of cheating is still in the spirit oft the sport and the other not. If you really love the sport, this is certainly not the kind oft discussion we should have! I’m still not sure why Mr. Rng has us arguing which form of cheating is worse, frankly. It’s got some people suggesting that as we’re steamed up about using a motorbike right now we’ve all forgiven dopers. When did that happen? When did it become a binary “one is cheating, the other isn’t”? I was reading comments to the last post pretty closely yesterday, but clearly missed this bit. I find this post odd and perhaps a bit unnecessarily divisive – at least, it seems to stoke the fires of division, anyway. For the rider, no – because of the health risks. For the sport – if it can be hidden successfully – yes (until or unless all that crazy biotech we hear about comes out). The comparison point is a very good one. Ideally, life bans for both – leave WADA (if that means leaving the Olympics, so be it – cycling doesn’t need it: each type has its world championships) and be more effective than WADA are. They’re far from a complete deterrent – they’re slightly more of a deterrent – but life bans mean the cheats don’t come back. But I’d have thought people are much more likely to dope anyway – so much more chance of getting away with it. The thing about motors, as you touch on, is that their use would kill the sport. By the way, always wondered, why do they use motor pacing – is it just so you can go faster? I agree in principle with Larry T. Any pro rider using electronic shifters already uses a (couple of) motor(s). Where does one draw the line between mechanical assistance provided to shift a gear and that to turn the cranks. Both save the rider energy. There is a line. It’s in the UCI rules about using only UCI approved equipment. When the UCI approve an e-bike, the line will have shifted. Until then, shifting is fine, motor is not. How is this not a black and white issue for you? It’s a big draw to find similarities between shifting and pedalling. Yeah, I find this extrapolation hard to digest as well. Bikes have inherent differences and tradeoffs. And some flexibility in design and application. Which is why it seems unappealing for many to restrict riding to a single frame by a single manufacturer using a single-sourced chainring of specified teeth using a single, standard issue cog in the back. Why? Because riders are also people. Meaning some are 1.50 meters tall and some are 2.15. Some are great climbers and some are great descenders. Some can contort their body so low they can get more aero than the competition, and some can sit on the wheels the whole day and destroy you with a sprint. So what does a reasonable governing body do? Make reasonable rules. I think most of us agree that having shifters is acceptable, from 7 to 11 speeds (maybe 12?). Most agree the sport should involve a fair amount of skill and balance, therefore restricting it to two wheels and not four. And despite significant dissent, that bikes in the recumbent position are a different sporting activity. And that helmets can be streamlined to provide protection to a regulatory standard and not impede your forward progress, that your clothes can be skin tight to provide minimal air resistance, and that your feet don’t need to be detached from the pedals to improve efficiency. So yes, these rules are arbitrary. And open to reform via (hopefully) reasonable discussion and consensus. You are correct in saying that using electronic shifting saves you energy – I would be of the opinion to classify that under “negligible effect on fairness of competition”, all things considered. If only one group had access to certain technology I would be more opposed – as it happens every 4 years when well-to-do nations deploy exclusive-access technology and win medals, despite rules that attempt to restrict these imbalances. It does seem a bit of a minefield once you go beyond the obvious. Motors reduce the effort needed to make the bike go forwards, using chemistry in the battery. Aero frames reduce the effort needed to make the bike go forwards, using the physics of airflow. Electronic shifting does not reduce the actual effort needed to make the bike go forwards, but does save the rider some effort so perhaps nett the same thing. Me? I’m off to the shed to continue building a laser sight into my snooker cue. go to google. laser sight already done, also predictive cueing accounted for. really need to get off your soapboxes, quit gripping about how it should be/was when I was a boy, and man up to the fact that the real world does not function in the way you wish. OK, I obviously can’t speak for Paul, but I was just running with a bit of frivolity of this comment. As INRNG says below (and other people have chatted about above), the sport is what is defined in the rules by the governing body, and I’m perfectly happy with that. If at some future point the UCI say you can have a motor with a small battery then I would enjoy seeing how riders use it tactically (run it long and slow for a sustained small gain, or one big kick at a crucial moment) – could be fun (though I would rather they didn’t go down that route). Sport is competition along agreed rules. We’ve agreed to ban motors and have a banned list of pharmaceuticals and doping methods. We’ve agreed to allow shifters. I don’t think you should slap a lifetime ban on an U23 for anything, U23’s are idiots, I know I was at that age. Clearly something very very wrong with the coaches and whole system that rider came through to have a doped bike and a doped brother. If it were up to me it’d be 4 years for the rider and lifetime bans for any coaches who had a hand in this. And I’m not sure if this is in Mr Cookson’s remit but…. Could we maybe stop that family from breeding anymore? The rules do stipulate for bans for the team too, interesting as this doesn’t apply to doping in the same way. Presumably because there’s no plausible deniability for the team in the motor case. Make teams 100% responsible for their bikes – that’s perfectly reasonable. They check their own equipment morning and evening (using different mechanics each time). Therefore, they cannot fail to spot a motor that a rider adds to their bike. Either that, or the team is adding that motor. And, for once, the team bosses are held responsible. That will make them stop this. The UCI should be able to at least check the bikes of the top ten finishers – plus som random (or not so random, if necessary) checks. Agreed, shifting a lot of the liability to the teams is the only way to systematically enforce this rule. If a General Manager is terrified his team will lose it’s UCI license or be fined, then he/she will ensure the DS checks the mechanics work, and then the mechanic will ensure that all bikes are compliant while they do the daily cleaning and checks. Then each of these people will ensure that all bikes on the cars are clean. If we assume that yes, Fabian Cancellara used this technology in the past, then there is no way that Team CSC’s mechanics, soigneurs, DS, and Bjarne Riis didn’t have, at the very least, strong suspicions this was happening. Am I the only one who can’t stop singing this? Thank you, J E. I have a black hole where Manic Street Preachers should have been. I don’t think it is pertinent to try to do a classification of cheating. Doping and motor have the same goal. For me, the difference between mechanical and chemical doping isn’t so much that one is worse than the other, rather that one is cheating *at* cycling whereas the other takes you outside the bounds of cycling by getting an outside agent to do some of the work. Cycling is all about getting someone else do your work. I think that one important point has gone missing when sanctions are concerned. A sanction isn’t just about the punishment, and thus can’t be reduced to “proportionality to the fault” (which is a part of it, indeed). Sanctions are one element within a system of policing, which, as such, involves on the one hand the need to detect the crime and to ascertain the facts, on the other hand aspects like authority or power. The first part of the problem has been commented by several readers above: I think that especially Carton described the situation quite well. Sure, we can’t have justice on this earth, still justice is one of the utopian leading principles of law, which means we should try to behave, while *building up* the law, with that principle in sight. Handing out extreme sanctions is just… easier (more feasible, more logic, more coherent with a general principle of justice) in the case of motor bicycles than in the case of biological doping because the detection part is easier. A lot of biological doping cases wouldn’t stand the more severe scrutiny of a *true* court (the Heras case recently cost nearly 1 million to the Spanish State because the rider ended up winning). The sport, as a sort of “private club” holds the right to manage itself with its different jurisdiction, no doubt, but here I’m taking the justice courts as a sort of a meter: with all of her friend story and so, I’m afraid that Femke would endure a hard life to defend herself in a court of any kind. The investigation part is easier, too, to understand where the responsibility really lies. We put our conscience to sleep saying to ourselves that a rider *must know* what he or she is taking, and the sport set its rules according to that idea. Still, the reality of the sport is quite different, as some reader pointed out elsewhere. It’s more like a continuum; plus, if you work within a team, it’s all about trust in your manager/trainer/doctor (in every sport) – and when it’s not about trust, too many times it’s about abuse and authority. We decide to lay the burden on the rider as the ultimate terminal of the action, and that’s fine, but the lines are quite blurred when we start asking questions about the levels of knowledge and consciousness implied. This is not to say that “you can’t blame the riders, you shouldn’t punish the riders”, but, surely, when you’re writing down the law you should take into account these factors, and not only in the name of justice, but also in the name of effectiveness: punishment is really effective only if it strikes the original source of the decisions. Besides, a set up or a “contamination” by your rivals is way easier to realise with biological doping than with mechanical doping. We’ve had several examples of the former, in different sports but also in cycling (even if it hasn’t been finally proven for sure – which stresses the point I’m making). As many commenters pointed out, all this part is easier with mechanical doping, too, which as a consequence allows more room for heavier sanctions. The second part of the problem hasn’t been very much explored, here, which says a lot about the evolution of our political thinking. Even the most legitimate ruling powers – however well-constructed might the government structure be – can’t be taken for granted as benign entities. When everything works fine, the counterbalance of different powers, the bottom-up controls and so on tend to assure that abuse is prevented. Yet, structures can be overcome, rules can be manipulated and forced and so on. Examples aren’t lacking at all in supposedly democratic States in more or less recent times, and, well, imagine that a State has been way more carefully built, in terms of structure and political balance, than sport institutions! That’s why, in general terms, it’s better to moderate and set limits to the powers of those who are in charge, including the power of inflicting sanctions. You never can be sure about the way those powers might end up being used, or about the finalities they’re being used for. If this looks like distopia, well, just think about Hein. I’m pretty sure (or I’d like to be pretty sure) that Cookson isn’t half as a *movie villain* type as Hein reportedly looked like. I really hope that long gone are the old, old times (4-5 years ago?) when antidoping was being used not as a form of policing but as a policy to manipulate the politics within the sport. The sheer nature of antidoping tests (a quite weak chain of custody, which has been exposed in several justice courts; the very technical nature of some tests; and so on), not to speak of the bio-passport procedure, give room to manipulation. Probably it’s not happening right now. But it has been happening, and nothing is preventing that to happen again, even if the institutions are apparently working to make things better from this POV. All that considered, it should be easy to see why raising the punishments about biological doping can have unfortunate effects, whereas with motorised doping not only it’s easier to have things straight from the POV of the detection, but it would be also easier for the riders to protect themselves against false accusations and the likes. You can track and seal your bikes, you can record on video the checking procedures and so on. I’m totally against life bans in this case, too, but I see the whole matter of sanctions from a “reverse engineering” perspective. The question is not “why should we punish harder the mech doping?” as well as an admittedly more complicated one: “are the troubles which *should* prevent heavy sanctions for bio doping equally in place for mech doping, too?”. Your pragmatic arguments remind me of Popper’s political theory. I’d take that as an ouright insult 🙂 …but a benevolent one, I hope? I’ve always been in favour of life bans for doping, but your points about how corrupt the people who decide these things could be has made me doubt my beliefs. Certainly, under previous regimes, dope-testing was used as a way to punish some and not others – specifically to protect one from his competitors. Hopefully, the new independent doping commission (chapeau Cookson) would prevent that, but it is only a hope. I can only remember F. Schleck claiming he had been poisoned – and didn’t believe him for a second – have there been others? Who? The Garzelli Probenecid case was utterly strange. It’s *very* far from sure that it was a set up, yet there was a number of elements to believe so. Sorry but its piqued, not peaked. Just my OCD side coming out, please don’t mind me & carry on. You don’t think it’s possible that Bruyneel spiked Frank’s food in order to sideline him because Andy wouldn’t stop waiting for his brother? F. Schleck was suspended for 12 months following a positive test for xipamide at the 2012 Tour de France – a race A. Schleck never started. Then, you have F. Schleck’s previous connections with Fuentes. PT, you mean ‘it’s piqued’. Without detracting from the generality of what you say, I have to question and disagree that Femka has a poor case in a court that presumes innocence as a starting point. As the facts are presently (inadequately) known the bike was in her team’s compound without her knowledge whilst she was out racing. As far as we know right now, none saw her near it; she did not ride or race it. Her testimony is that in the immediate circumstances she had no knowledge or intention concerning the bike. At the moment, the story of how the bike came to be where it was found does not, if it is corroborated by the mechanic, include her at all. As it stands, the only reason for the UCI to be so sure of itself is the content of its own particular rule 12.1.013 and even here I think it convicts the team but there is still a doubt over “the use by the rider” part of that regulation in the circumstances of this case. Yeah, it’s quite a strange example, since laws are also written thinking about courts, while here we’d be trying to apply in a “regular” court a set of rules created with a sport tribunal in mind. However, being convinced as I am that the *underlying reality* of this situation differs from the story we’ve been told by Femke, I believe that a prosecutor could corner her in a court more easily than what has actually been possible with bio-dopers – assuming a due amount of work gathering testimonies or finding inconsistencies in the defense’s version. I’m not saying that – knowing *only* what is presently known – she is nailed, what I’m saying is that *if* this really was a case of mech-doping, she should be pretty easy to find guilty even in a normal court, because she’d really need to be lucky to find a mendacious story which properly covers all the needed aspects. Also consider the risks that the supporters of her version would face in case of false testimony… would all of them stand for the cover-up story in a real court, with the possible implied consequences? Naturally enough, if she is *really* innocent, most courts would struggle to prove her guilty… but that’s another story. I understand you. Of course in a court of law the burden of proof would be with the prosecution. I don’t think the outcome should be on the balance of probabilities either. Also in our hypothetical court of law it may be that any facts concerning previous races would be inadmissible in evidence -so mystified/aggrieved competitors from the Koppenbergcross would be irrelevant. But I think evidential things like bike set up to fit the rider would be important – I wonder if, even in its own investigatory context the UCI has taken seat height; saddle to bar reach; saddle to bar drop measurements from both the aberrant bike and the one she was racing as a matter of procedure? If such measurements are identical she has another problem. Anyway, so I get it that you are not prejudging. And if the UCI investigators did not take such comparative measurements before they took their allen wrench to the seatpost of the offending bike, a key set of evidence will have been effectively destroyed by the UCI – which would be great for the defence who might call into question the entirety/existence of proper testing protocols. One positive (sorry) from this story is the rule and that it holds the team liable as well. Guilty or not, Femke has already been convicted in the court of public opinion and, if innocent, she would never be able to clear her name on her own. With the team facing a ban as well, she has an ally in her defense or a source of the facts against her and we’re bound to learn exactly the facts regarding the provenance of the bike and it’s whereabouts timeline before this is all over. Wasn’t the rule that the punishable offense is to have the bike there, even if if you did not race it? In that case it does not matter. And the debate about electronic shifting might turn up a little different, too. We agreed that it’s fine if a battery helps us to shift, and that’s ok, but as J Evans says above, it might be something which complicates the detection of motorised bicycles. The battery could end up being the most detectable part, since (for what I’ve understood) its dimension is proportional to the “quantity of help” it may offer. Getting rid of bigger batteries, you’re at least reducing the impact of cheating, even if you weren’t totally getting rid of the whole cheating thing for good (bio-passport approach). But with e-shift, you’re allowing batteries whose dimension is typically superior to the minimal you’d need to just ride a stage. Sure, they’re bigger to last longer, which depends on different technical specs, but this situation gives room to camouflage and makes the whole detecting thing a bit more complicated. “What the heck is this battery doing here?” is a way more damning question than “is this battery the appropriate one to feed just your e-shift system and not some hidden motor?”. Note that my understanding is that no “bike computer battery” or “radio battery” would serve for the purpose as easily. I believe they’re ahead of you here in the detection department. I was immediately reminded of Boris Onischenko and his cheating in the modern Pentathlon in 1976, in that it goes beyond what you could persuade yourself was enhancement to blatant fraud. The Observer had an interesting top 10 cheats in history with only Michel Pollentier from cycling making the top ten although it was written before Lance was exposed. Thanks for that link, a lovely read. One thing that jumped out relevant to today’s discussion was no. 6, the marathon: 1st finisher was DQ’d due to mechanical doping (the guy got in a car), but the win went to a chemical doper (strychnine and brandy, it was 1904 after all). ‘The rules of the sport were changed, though, banning grips that could hide wires or switches’. If batteries for electronic shifting makes it harder to spot hidden motors, get rid of them. Better to make riders suffer the use of mechanical shifting than making it easier for them to cheat. Speaking of mechanical doping, I found that through the simple addition of an extra computer magnet on my front wheel, I literally doubled my speed! That’s Wout Van Aert? Yeah, that video looks extremely suspicious. I can’t draw any conclusions – don’t know enough about actually riding a bike (the guy at the very start of the video looks a bit dodgy to me too – but he could have just pushed himself off before the film starts). There must be an awful lot of people on here who do know, though – opinions? Saw this earlier doing the rounds on social media and thought it’d be better to see the original. You can see the youtube title and the time within the shot. I still don’t know. Anyone care to venture an opinion? Looks very suspicious but I’d like to see it in slow-mo to be sure. Van Aert rides a Colnago Prestige with a traditional 46/36 SRAM Red 22 set-up and Avid Shortys, but with aero bars and Zipp wheels. It’s a light bike – around 6.8 kg, so a hidden motor unit / battery would add a lot of noticeable weight to it. The full race at Hoogerheide was run on a mixed course but in reasonable conditions, tacky in areas but quite quick so the riders were probably on a quicker tyre choice. The course immediately prior to the footage above was a steep little uphill section, some choosing to pick up and run, including Van Aert. Then it was back on the bike, along a flatter straight and a turn down in to the muddy corner on the footage. Van Aert took a very tight line, almost stopped and then, his smoother (?) back tyre span rapidly in the mud as he powers to move upwards again and out of the muddy corner. Mixed conditions terrain, some uphill / flatter sections together so gear choice may have been inappropriate for the muddy corner? It doesn’t look so dodgy in context, is what I’m saying. Theoretically, what would cause this? The motors I’ve seen drive the bottom bracket, which means the cranks and pedals turn. Would this be the electromagnetic wheel thing? I’d love to get the battery they must have powering that – I just can’t see how you’ve get a battery powerful enough to run electromagnetic pulses to spin the wheel with enough watts to be useful, and still be able to be hidden inside a frame. As always INRG and his topics on doping chemically or mechanical brings up our blood pressure more then a 5K 10 degree climb. Would be curious to know the opinion of a confessed chemical doper. inrng won’t want to say, but surely people here must know if this is dodgy or not: 10.55 in. The guy spinning his wheels in the mud? Happens to me even on a mountain bike with 60mm tires. I took it and used software to make a slow motion GIF image and replayed it in slow motion. It looks normal this way, his pedal stroke corresponds with the wheel. Good work – thanks. The sort of thing that makes this blog what it is. Has Inrng (or anyone here) looked at that video on Youtube about Fabian Cancellara allegedly using electric motors in 2010? I went through it and I’m not convinced anything is wrong. In the Ronde part, it looks like he’s selecting a harder gear, but pedalling the same speed so he naturally goes faster and pulls away from Boonen. The Paris-Roubaix is less clear, but he could be doing anything. The suspicion is because Cancellara rode so fast and there’s not much more to go on. The moral of the story is that youtube has plenty of creative ideas. Agreed – maybe the aliens are part of the Fabian story. ‘PT, do you really think Cancellara rode a bike with extra levers on it and no-one in the media noticed? And no-one in the peloton noticed or said anything? Surely a huge advantage of getting rid of the weight limit would be that the proportion of weight a motor would add would make them unviable (for a few years at least?)? Even now it makes a big difference. For all the buzz about La Gazzetta’s “secret magnet motor inside a wheel” you’d only have to weigh it in your hand or on some €10 kitchen scales to know spot it’s significantly heavier than the spec weight from the manufacturer. Even in HD, Van Aert make a weird spin… very weird. The wheel seems to turn so much faster than the light 1/10 of the pedal stroke. Chemical doping is worse for people. Motor doping is easier to catch, and also easier to prove that the team knew about it. I don’t believe in lifetime bans for first offenders of anything. Just keep doing the controls, the high probability of getting caught will act as the deterrent, that is more effective than long bans anyway. I think this will be a much bigger problem in amateur races, where there is no equipment to do the checks. Yes, agreed on all points. I think that Inner Ring has said in the past that the 4 year ban for chemical doping will result in an end to a meaningful pro riding career anyway. I’m sort of the mind that mechanical doping should result in a lesser ban but severe financial penalties, even private court action from the UCI or bicycle manufacturers. Motors or doping, lets just call it Cheating and on so many levels. If bans were retrospective (not just backdated after a prolonged investigation) as well as prospective it would be a stronger deterrent. Don’t just face a few months or a season on the sideline, lose your whole palmares including amateur results too. After all, the problem with liars is you never know when they start or stop. Also, is it just me or has use of the term “doping’ passed its use by date? Lets call it cheating – of which there are many forms. Or to be more genteel but equally specific: un-sporting conduct. Behaviour which compromises the spirit of the sport. Doping is a weasley euphemism which chains us to a corrupt past. No. Doping is a specific form of cheating, where you supercharge the rider with chemicals, or now also applicable to the bike with motors. There are many other forms of cheating that are not called doping, like taking the train, having your DS tow you in his car, hitting your opponent to the ground or selling your win to the highest bidder. Post script: clearly, its not just me. Sorry Anonymous, didn’t see your comment in time. At this stage, the safest bet is to assume everyone’s cheating and merely choose your favourite cheater. Works for me. People assume that no-one is cheating because they want simple answers and it’s easier for them to deal with. People assume that everyone is cheating because they want simple answers and it’s easier for them to deal with. But unlike these assumptions, the reality is unfair – only some are cheating. And it’s complicated – because you don’t know who. OK, who’s not cheating? Without a doubt. OK, who is cheating? Without a doubt. As I say above, only some are cheating – you don’t know who. Good read and loads in comments know more than me so feel free to shoot this down. But if the UCI supplied everyone with the same cranks – which could have metal webbed on inside or a tamper proof seal of some sort – would that not work? They could be chipped and scanned before/after every race. As an added bonus it’d give them the chance to track performance midrace and drag the sport into this century (from a TV perspective). Realise there’d still be huge challenges in persuading teams to sign up to one central manufacturer and it’s probably not possible because of that, but just a thought. It’s a good idea and one of many simple solutions that could go along way to preventing this. But the business of flogging bikes – and the bits in them – won’t allow this. The bike companies should, of course, be told where to go, but that won’t happen – money will trump fairness.